This year, Barbie joins the ranks of the world’s greatest superheroes and shows children that Anything is Possible, by declaring 2015 the year to #BeSuper! This Spring, Barbie™ is launching superhero-themed toys, a DVD, books, role play, and more, as a way to inspire girls to creatively express what “super” means to them through play. Barbie has also created a unique online empowerment campaign called #BeSuper, to encourage young girls to make a difference in the world and share their super acts with their peers by tapping into their inner superhero by celebrating their own acts of "being super". 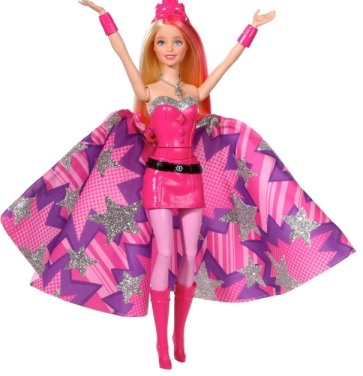 Every super team needs inspirational leaders to rally the troops, and the Barbie™ Super Squad is no exception. Four Canadian girls who are all doing super things in their communities were invited to act as ambassadors for the Super Squad, and share their stories to inspire kids from across Canada. Their profiles and stories are featured on the site to show other children how simple acts and ideas can have a large impact. The Super Squad Leaders will receive a combined $15,000 to support their causes to help continue their incredible work. Barbie™ is bringing her superhero powers to the small screen with an all-new, action-adventure DVD movie: Barbie™ in Princess Power. A modern-day princess story, the movie will inspire and empower girls to discover their own inner superhero and showcases that there is no greater power than that of friendship. Barbie™ in Princess Power is now available on Blu-ray™, DVD and Digital HD at retailers nationwide. Movie screenings for Barbie™ in Princess Power will be held at select Cineplex theatres across Canada on March 21, 2015, and Super Squad Members can download their free tickets on www.BeSuper.com. Girls are invited to walk the pink carpet in their best superhero outfits, and bring a canned good for their local food bank. They’ll also get to meet their local Super Squad Leader, meet other Super Squad members, and win exciting prizes. Barbie as Super Sparkle™ will also make a character appearance at one special location. You can enter for both giveaways, however please enter the giveaway through both the rafflecopter below as I will pick the giveaway #1 winner on March 15th and giveaway #2 winner on March 27th. Please leave comments and follow my social media links to be eligible to win. We live in London Ontario and I think this is a great initiative. I live in Delhi Ont. and this is great of Barbie, since little girls love to follow Barbie and do what she does! I live in Hamilton, Ontario. I think this initiative is inspiring. I live in Durham Region, My DD3 love Barbie and I love that Barbie is now SUPER! I live in Ottawa. My 5-year-old daughter loves Barbie and doesn't see her the same way as I or other adults do. If she starts to ask questions, we'll talk about it. I think that if this initiative generates communication then it's a great one. We live in Brampton, ON. I think the idea of Barbie having super powers is cool!! I live in Newfoundland and I think it is a wonderful idea. I live in Ontario, I think its a great idea! I live in Ontario, I think this is fantastic !! I live in Ontario. I love that Barbie has some super powers, great incentives for the girls. I'm in BC and i like this! I live in Ontario and think this initiative is great! I live in BC. I love that the super things the girls are doing are so real; like doing real things that are super (being kind etc) instead of just pretending to have super stretchy arms or being able to fly. I live in calgary, ab and love this empowering campaign! I live in Newfoundland and I love this initiative! I live in Mississauga, Ontario. As a mother of two young girls I think it's a great initiative to help girls realize their inner strength. I live in Ontario and I think it is a great idea. I think it's great, it will have influence on the kids that play with Barbie. I live in NB. Any initiative that encourages girls to feel empowered and strong is a worthwhile one in my view. I live in Ontario and I think this is a wonderful initiative! It's important to raise the girls awareness of what they are actually capable of doing.. anything! I live in SK. I think its great to have both female and male super heroes! I live in Toronto and i love how Barbie encourages girls to be their best. I live in BC. I like the idea of showcasing girl superheroes!